I’m generally a good sleeper. But whenever I travel, the first night or two of my trip are inevitably a bit sleepless. Once I get into the traveling rhythm, I tend to get a good eight hours a night, but that might be because I’ve developed a few handy sleep strategies over the years. If you’re one of the many travelers who have trouble sleeping well on the road, check some of these tips to ensure you’re bright and fresh the next morning for a day of exploring. Your body thinks it’s clever, and takes light signals to mean that it’s not time to sleep. If you can, make your hostel or hotel room as dark as possible. A lot of accommodations, especially in cities, will be near flashing neon lights and street lamps, so make good use of your curtains or blinds. Same goes for those who have the need to get up in the middle of the night. At home, you can probably stumble to the bathroom without turning on a light, but that’s not advisable in a strange place. Take a small flashlight that is bright enough to show the way, but not to make you feel like it’s day time. One immediate problem here: hostel bathrooms. In my experience, they usually have harsh, bright fluorescent lighting that burns all night. My solution here is to act a bit groggy and keep my eyes half shut. Fellow travelers might look at me strangely, but then again, you don’t usually pass too many people in a hostel corridor at three in the morning. I used to scoff at people who did this. In fact, I went backpacking in Russia with my mother — ultra-light backpacking, in that we both had only a small daypack for our two-week trip — and couldn’t believe that she decided to stuff her favorite pillow into the precious space of her backpack. Turns out — of course — my mother knew what she was doing. We stayed in homestay apartments where Russian widows had turned their sofas into beds, which were some of the most uncomfortable contraptions you could come across. But my mother slept well. If you have a problem sleeping while you travel, try lugging a small but favorite pillow with you. A combination of having the right pillow for your size and the familiarity of an object from home could really improve your night. My number one reason for waking up in the middle of the night in a strange hotel is that the temperature is wrong. If you’ve got the luxury of a room with control of the air-conditioning, experts say that setting it at 70 degrees is optimum for a good night’s sleep. If you haven’t splurged on a private air-conditioned room, then make sure you dress appropriately. When I’m traveling I rarely wear what you’d traditionally call pajamas to bed. It’s usually a combination of normal day clothes that are layered to suit the climate, and I personally find I nearly always need socks — warm feet can lead to a warm, happy sleep. Be careful about leaving a window open. I love fresh air, but if you’re new to a country, ask someone else first. Waking up to a swarm of mosquitoes is a sure-fire way to ruin a night’s sleep, for example, and in other places I’ve been shocked by the sudden drop of temperature overnight and have woken up freezing. The mother I’ve already mentioned — she who lugged a pillow across Russia — is a fan of aromatherapy and has an essential oil for every situation. One I’ve had a great deal of success with is lavender oil, and it usually comes in a handy small bottle just right for traveling. Dabbing a couple of drops of lavender on my pillow has had a double effect — it blocks out the otherwise uninviting smells of some hotel or hostel rooms, and it seems to relax me enough to help me sleep better. This might be purely psychological, but I figure it doesn’t matter, as long as the results are what I want. And there is some expert evidence to suggest that inhaling the scent of lavender can actually help you sleep deeply for longer. I’m a worrier. For years, I had a really hard time sleeping the night before an early bus or plane trip. Since this situation occurs quite a lot when you’re traveling, it started to become a real problem — I sometimes got too tired to really enjoy my trip. There were two solutions for me. First, I made sure I had a fail-safe alarm (or in fact, two, if I had a particularly early connection to catch). I double-checked that the alarm was set last thing before I went to sleep so I could be sure there was no need to worry. Second, I had to start using that relaxation and meditation training I’d done to help me get a good night’s sleep. Whatever works for you — deep breathing, repeating a mantra, visualization — learn about it and use it. I also make it a pleasant habit to think back over my traveling day and recall the best parts, to lock them a little more deeply into my memory. The great thing about traveling is that very often, your time is your own. If there’s some reason why you just can’t get a decent night’s sleep, it doesn’t really matter. It’s not like you have to go into the office the next day and make an important presentation. So if you end up feeling exhausted in the morning, get up and spend the morning doing something interesting, then take a short nap mid-afternoon. I think this kind of nap should be less than an hour long, and definitely not too late in the day. For me, it has to be over by four o’clock, or it’ll lead to more sleeping difficulties that night. After a refreshing hour of shut-eye, head back out into the strange world around you and enjoy it. And then have another attempt at getting a good night’s sleep. 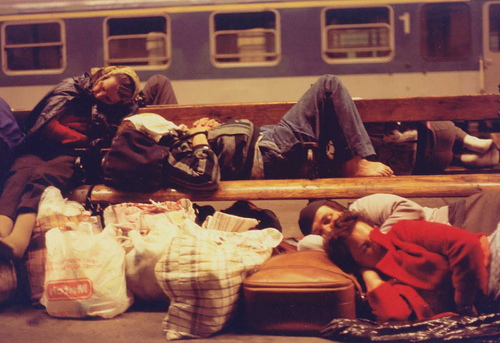 What helps you sleep while traveling abroad and to foreign places? Share your tips in the comments below! Great article! I have this problem when traveling… I usually have a problem with pillows. Why it never occurred to me to simply bring my own is beyond me. I like to pack light, but I would prefer to sleep well! I also really like the lavender tip. Thanks for sharing. One other thing… Bring earplugs! There are all sorts of random and strange noises to wake you up in a foreign place. Whether from the street or from fellow hostel-mates getting home late, a cheap set of foam ear plugs to sleep with can make a huge difference. ivervi, glad you liked it. Hope the pillow thing works out! Nathan, good point. Cheap, small, light, ear plugs are the perfect traveling companion. Thanks Tony. You know, some people told me they were skeptical about the lavender thing … but you just have to try it to know. It definitely works for me =) Let us know how it goes! First you can use them in the plane to block the air noise and sleep better, because ambient noise really tires you. Then when we come to the hotel it will help too. In the hotel, request a room far from the street. Although right here in South Beach Miami a room back from the street will often be next to the trash. So then early in the morning you are waken up by the very noisy trucks. But in third world countries it works. And then a sented candle to get rid of unfamiliar odors and smells. Have a great trip all. I’d also recommend a sleep mask. They take up almost no space. I take earplugs one step further and travel with a white noise machine; there are now even websites dedicated to the production of white noise if you have your own room with internet.